CITGO Lake Charles has made a $300,000 contribution to the First Choice Campaign for McNeese State University. McNeese has launched a three-year First Choice Campaign with its local industry partners and contractors with a goal of raising $1 million per year for those three years for sustaining growth and self-sufficiency. On hand for the presentation are, from left, Marshall Watkins, CITGO general manager operations and maintenance, Jerry Dunn, CITGO vice president and general manager, Gov. John Bel Edwards, McNeese President Dr. Daryl Burckel and Ryan Vining, CITGO general manager engineering and technical services. Gov. John Bel Edwards and McNeese State University honor CITGO Lake Charles for its $300,000 contribution to the McNeese First Choice Campaign. With recent decreases in funding, McNeese engineered an innovative plan to self-generate revenue with a goal to meet the needs of growing academic programs in support of the economic boom in Southwest Louisiana. “Each year, McNeese awards nearly 62 percent of the public four-year degrees earned by students from the five parishes that comprise our communities. This university is vital to Southwest Louisiana, local industry and to our future success here at CITGO. 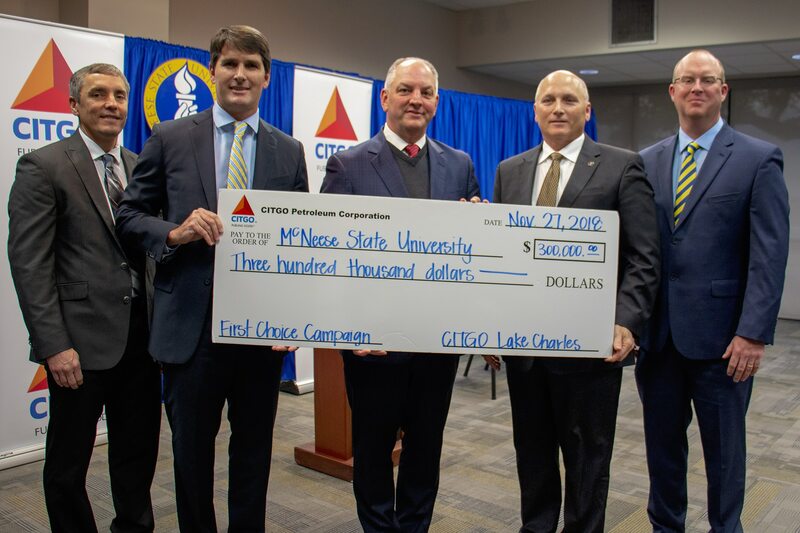 For these reasons, and many more, it is very important that we partner with McNeese to fuel education and help support the First Choice Campaign,” said Jerry Dunn, vice president and general manager of the CITGO Lake Charles Manufacturing Complex. It is the hope of McNeese that this partnership will continue to expand economic development and enhance the quality of life in Southwest Louisiana. “We are positioning McNeese as the first choice for potential students, for employers seeking the most qualified employees and for donors who want to make an investment in the future. CITGO is a longtime partner and supporter of McNeese and this commitment to the First Choice Campaign will provide necessary resources to sustain growth in high demand academic areas,” said Dr. Daryl Burckel, McNeese president. CITGO will contribute $100,000 per year over a three-year period for a total donation of $300,000 to the McNeese First Choice Campaign. The company’s contribution will be physically recognized with a CITGO plaque in a special academic location within the university. 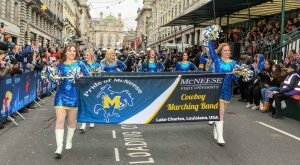 Established in 1939, McNeese State University is nationally ranked as one of the top public universities in the United States, is recognized as one of the finest regional universities in the South and is known as having one of the best returns on investment for tuition and high average starting salaries for its graduates. The university also serves as an economic and workforce development partner for Southwest Louisiana employers who are seeking well-prepared employees. In 2013, McNeese opened the Southwest Louisiana Entrepreneurial and Economic Development Center. The SEED Center, a partnership between McNeese, the Southwest Louisiana Economic Development Alliance (which includes the Chamber Southwest Louisiana), the Calcasieu Parish Police Jury and the city of Lake Charles, is dedicated to strengthening and diversifying the economy in the five-parish region. The mission of McNeese is to change lives by providing “Excellence With a Personal Touch!” Our vision is to be First Choice for students seeking a university degree, First Choice for employers seeking university graduates, First Choice for donors wanting to support the community and First Choice for organizations seeking professional expertise. McNeese is a member of the University of Louisiana System. Visit mcneese.edu or contact publicrelations@mcneese.edu for additional information.